Nokia Lumia 928 handset breaks cover, is it the new flagship device? Handset features Verizon branding, will a UK launch follow? The Nokia Lumia 928, reported to be the company's next top shelf Windows Phone device has emerged in purported press shots leaked online. The device, which is rumoured to be a thinner and lighter version of the Nokia Lumia 920 device, has appeared thanks to serial tech leak artist @evleaks. 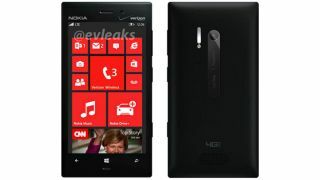 The handset is branded with the Verizon Wireless US network, which suggests it'll be a counter to the Nokia Lumia 920, which is an AT&T exclusive in the country. Previous rumours had suggested the device will launch on Verizon in April, but what isn't clear is whether Nokia will bestow the device upon Windows Phone fans in other territories. Previous speculation had suggested that the Lumia 928 will bring a xenon flash to complement the 8-megapixel PureView camera. Other internal features are expected to remain the same as the Lumia 920, while initial reports that the device would tout an aluminium body were soon rebuked.